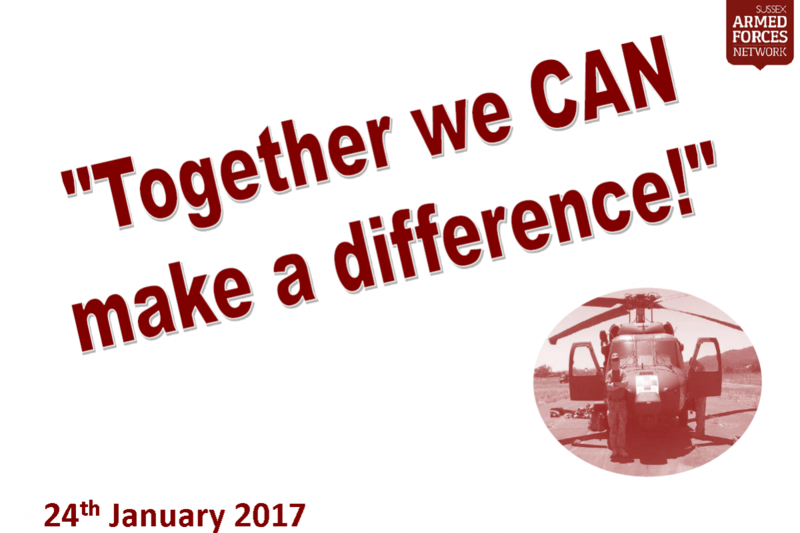 At the “Together we CAN make a difference!” event on 24 January 2017, an award ceremony took place showcasing some of the excellent work undertaken by the Sussex Armed Forces Network Champions. 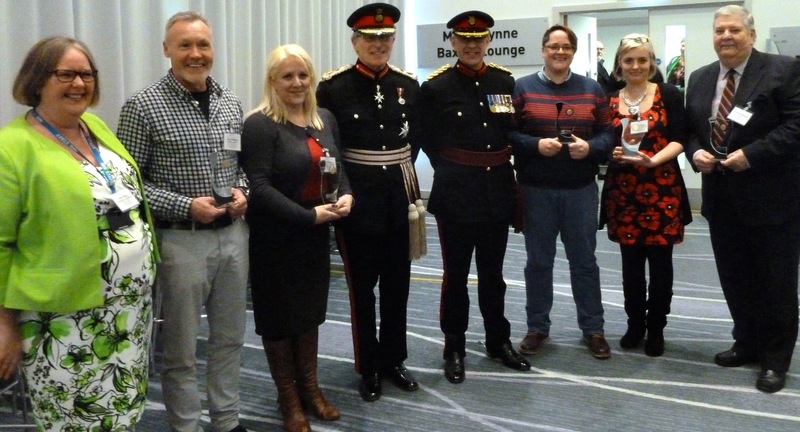 Whilst we would like to have given all of our Champions an award, the following Champions have stood out for various reasons and they highlight the dedication and support being offered to the armed forces community in Sussex. The Awards were announced by Assistant Brigade Commander for 11 Brigade, Andrew Wood and presented by the Lord-Lieutenant for East Sussex, Peter Field. Pictured above are the winners alongside the Assistant Brigade Commander and the Lord-Lieutenant and from left to right are, Kate Parkin (Armed Forces Network), Garry Botterill (Sussex Police), Jennifer Barnes (Sussex Partnership Foundation NHS Trust), Peter Field (Lord-Lieutenant for East Sussex), Andrew Wood (Assistant Brigade Commander for 11 Brigade), Emma Chaplin (Action for Blind People), Vicki Pattenden (Armed Forces Network) and Bernard Stonestreet (SSAFA). Sergeant Garry Botterill works for the Sussex Police Chichester District Response Team. Garry has been awarded the Champion 2016 for his unduly dedication to the champion role, presenting to his colleagues what this entails and offering to support the Network where needs be. Garry has included the support and assistance of the Network within his role at Service Dogs UK which has not been unnoticed. Garry goes out of his way to encourage and promote the champions role within other Police services across Sussex. Bernard works as a volunteer for SSAFA, the oldest military charity, and runs the Hastings and Rother Division. Bernard offers exceptional support to the Network and with the Armed Forces Community. The SAFN are extremely thankful and appreciative of all the time he offers on a voluntary basis. Bernard is also one of our Mental Health First Aid trainers, receiving excellent feedback for his knowledge and professionalism. Bernard is an approachable individual who will always go out of his way to help anyone and if he doesn’t know the answers then he will find them. Emma is an Eye Clinic Liaison Officer working for Action for Blind People based in The Sussex Eye Hospital in Brighton. Emma from day one of becoming a SAFN champion has been extremely supportive and will never say “No“ when asked to help this client group. She routinely asks the question of her patients and refers them to Blind Veterans UK. Emma is a valued member of SAFN, offering her assistance and recently working with the Network in producing the Eye Pathway for the whole of Sussex which will be distributed very soon. Jennifer works for Sussex Partnership Foundation Trust, Health in Mind service in East Sussex. Jennifer is being recognised for the amazing work and support that she offers on a regular basis to the Network. Jennifer will go over and above in her role as SAFN champion and we are extremely grateful for her time and effort. Jennifer will often take referrals on herself ensuring that this specific client group receives the appropriate and best care possible. Vicki Pattenden trained as an Armed Forces Champion very early in the programme showing high enthusiasm and engagement. She was appointed part-time as the Sussex Armed Forces Champion Coordinator whilst she continues to practice as a Paediatric Mental Health Liaison Nurse. In her for the Network she has shown understanding, dedication and support to patients and other champions. Her work is summed up by this plaudit from one of her mental health patients. “……You have fully understood the need for not just supporting me, but for supporting my wife and two children also. Treating us as a whole “single” unit, rather than just me as an individual and helping to provide them with access to their own support networks has been a major part of how me, and my family, have learnt to work together..…..